For season 2011: The house has been very popular with our guests do take time to look at the reviews. Estellencs is 'home' for my family. Our parents bought the properties in the 50s when Estellencs was a backwater with a single daily bus to Palma .The over crowded bus was blessed by the priest as it left the village square. Although we are a Brittish family we spent some years living here and went to the village school . Since then we have returned with our own families who love coming here as much as we do. We have grown up knowing all the locals . Most of the people here earn their living by working in the local hotels and bars as well as looking after their fields. In recent years malvasia vines have been planted which produce a white wine. Life is lived at a slow tempo here , time to absorb the beautiful landscape and watch the amazing sunsets over the sea. This house has the charm and atmosphere of the old village houses but in a quiet and peaceful location. It is comfortable for up to 6 people + 1 baby for whom we provide a cot and high chair . Guests who come and stay have often returned . It has the feeling of times past but now with the facilities of today You can walk out of the door to walk , go to the beach or go on the bus ( they are now quite frequent ).or car to discover this stunning part of Mallorca . sofa and chairs infront of a fireplace. A good selection for 6 people. The kitchen has an electric cooker with oven and 4 hobs. There is a basin with hot and cold water.A fridge , coffee maker etc. it is well equipped for cooking . there is a good sized window . good sized table with chairs and a bench. Has table and chairs , it is small but good for sitting in and relaxing with a lovely view of the hills. At the top of the house , suitable for sunbathing, seeing the stunning view . watching the sunset and the stars at night. The washing machine is in the bathroom which is spacious. The cot is placed in the dressing room next the first floor double bedroom. wifi NOT in the house .- available at the local bar - Vallhermos for the cost of a drink. We had a really relaxing and enjoyable stay in this lovely house. The interior is as interesting as the exterior, great to have both the roof terrace and the delightful little garden for eating out and soaking in the atmosphere. Kitchen well equipped, furniture is comfortable, altogether an excellent place to stay. Thank you. Thank you Karen for your lovely comments. We enjoyed the peace and tranquility of Estellencs and swimming and snorkelling at the nearby beach. A perfect holiday. Thank you - it is so good to hear from guests who appreciate this lovely village and like the house. Beautiful house in a perfect location! We had a really wonderful time in Nadia's house. Estellencs is a beautiful village and the views from the house are stunning. The house is spacious and pretty, and the garden is lovely too. We highly recommend staying here and will definitely be back. Thanks Nadia (and Maria)! We spend 11 wonderful nights at the Casa Rosa and can highly recommend the place. The house is furnished with love, has a lovely little garden terrasse where you can listen to the birds singing, the sheep bells and the dogs barking. on the other terrasse you can enjoy a great view of the sea and stunning sunsets. It is clean, well equipped with all you need. Estellence is a sweet little village with a few nice cafes and restaurants ( we can very much recommend Cafe Val Hermos and the Montimar restaurant), very friendly locals and the perfect base for trips to other great places like Deia and Valdemossa and beautiful hikes in la Tramuntana. We explored most of Mallorca's west coast while we were there and also ventured out to the south and south East of the island since when driving everything is quite close together and connections from Estellencs are good (better than from Valdemossa for example). Nadia is the perfect host providing us with detailed and practical information for our stay and even treating us to lemons from her garden. We will be back! We had a lovely stay at Can Rosa this summer. The house is beautiful, the furniture is very nice and the kitchen is also quite practical and very close to the centre of the village, altough the slope to get from there to the house is very steep. It has 4 floors (including ground floor) and a nice terrasse on top. There also is a very nice little garden where you can relax or have a meal & watch the landscape. Be careful, to go to the room on the top floor, you need to go through the room on the 3d, so not very practical if 3d-floor people need privacy. But for us it was OK for the kids. The parents' room (1st floor) goes with a private bathroom which is fine. All in all, we would do it again without any problem. I believe I do make it clear in the description that you have to go through bedroom 2 ( with 2 single beds ) to get to bedroom 3 ( double bed). The fire stopped 5 kilometres away from the beautiful valley and village of Estellencs.this fire was started in Andrax by someone throwing out some barbecue coals when there was a strong wind ! The last big fire was 38 years ago. Wir haben zu dritt 5 Tage zwischen den Jahren in Can Rosa gebracht und können es nur wärmstens empfehlen: Das Haus ist feinfühlig und gleichzeitig komfortabel renoviert, die Küche ist super ausgestattet, die Stromversorgung (viele Steckdosen), Heizkörper, Handtuckwärmer, Bettwärmer, für mallorkiner Verhältnisse excellent. Der Kamin funktioniert sehr gut, die Aussicht aus jedem Fenster überwältigend. Maria, die sich um alles vor Ort kümmert, hat alles so gut vorbereitet, dass wir nicht zu frieren brauchten, die Betten waren bezogen und vorgewärmt, alles ist sehr sauber. Wir kommen gern bei etwas wärmeren Temperaturen wieder, um dann noch mehr die Dachterrasse, den Garten und die schöne Lage genießen zu können. Weiterer Vorteil: Wenig "Touris", kleiner Markt an der Kirche am Freitag. Die Restaurants sind - bis auf die "Dorfkneipe" - zwischen den Jahren zu! Estellencs is approximately 50 minutes from Palma airport on the North side of the Tramuntana Mountains. The village has its own pebbly beach, which can be reached by foot (about 20 minutes) or is 10 minutes by car. The stone built village clusters around the little square and church and has seen relatively little development. The combination of the rugged mountain village terraced olive groves and views of the Mediterranean make it quite exceptional. There are good restaurants and a small shop. This picturesque village has been used by film companies looking for an unspoilt Mediterranean setting.The families living there mainly work their land and are involved in running the restaurants and two small hotels.Life proceeds at a gentle pace . Can Rosa has great old world charm with its irregular shaped rooms , old doors and beams. It has plenty of space for a family both for sleeping and for sitting both indoors and outside. Do note that some of the doorways are low so take care . Other Activities: Golf is available at Bendinat (30 ins). and sailing at Puerto de Andrax . Sandy beaches San Telm ( near Andrax) and Camp de Mar , both about 35 minutes drive. 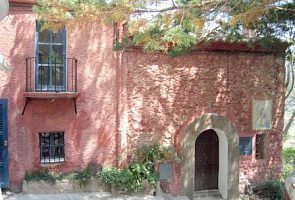 Tour along the coast visiting the most attractive villages along this most spectacular coast, including Valldemosa, famous for the one winter stay of Chopin and George Sand and Deya the long time home of the poet Robert Graves. Palma is well worth visiting with its handsome old quarter around the spectacular Cathedral overlooking the bay. It has excellent bars and restaurants as well as a fantastic choice of shops . The above prices are for 4 people. For extra 1 or 2 people there is a charge of 50Euros. **NOTE: there is 70 euros discount for sescont week and 75 discount for 3rd week To pay please send a bank transfer to Mrs Nadia Watkins, Barclays Bank London GB 23BARC204908 85623555. PLEASE let me know if payment is in another name so I can let you know when the payment is made.